As for me, I visited SPCA today, and this is my 3rd time here. 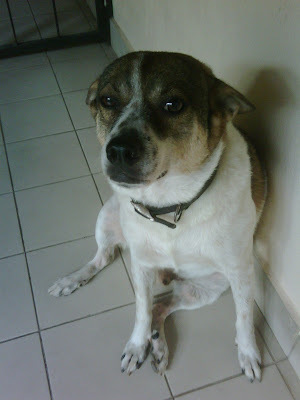 Since I have shifted and staying near SPCA, thought I could drop by when my friend came for a visit at my place today. So we drove there and we had a good time with the animals there. Was sad to see some of the adult dogs are being left behind, being abandoned by their owners etc etc, one thing it is, if you don't have the commitment, and thinking you just want to have fun when they are still a puppy, please pay a visit at the pet shops whenever you feel like it, instead of buying one and leave them somewhere later. Met this lady who is a voluntary, bathing a dog, she was telling us that how all this poor dogs ended up here, and how friendly some of them can be, while talking to her, I can feel the passion in her. How many people are willing to spend their weekends in SPCA bathing the dogs? I say I'm an animal lover, but when I met her, she really did show me how far can an animal lover do. 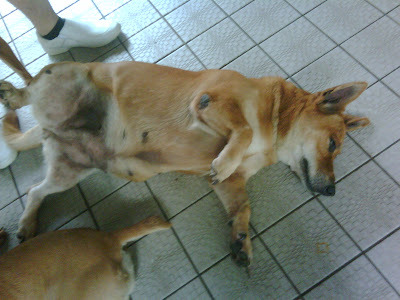 She is not dead, she is just trying to make my friend to pat her more, maybe some massage. Last but not least, I wanted to introduce Jack, my new neighbour since I have shifted here. Jack looks like a fat and clumsy dog, but you are wrong, he is one brave dog who runs after wild boars in my garden, and he can run real fast. Till then, another new week starting tomorrow, and my besties is back from Macau for a week, yahooo! Have u throw orange yet ?? ?